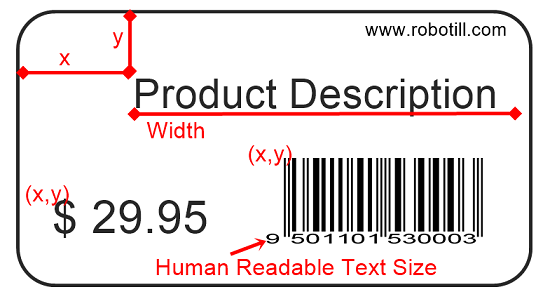 Product Labels – The barcode labels on the products. Shelf Labels – Labels for you shelves to display the prices. With these labels you can optionally print an up or down arrow so that the customers will know if it’s displaying the price for the products above or below. Labels are printed with an EAN-13 and EAN-8 barcode (system will automatically use the correct one). If your products does not have their own barcode numbers, you can let ROBOTILL generate the barcode number for you. To print labels, open Manager and to go Tools > Print Labels. 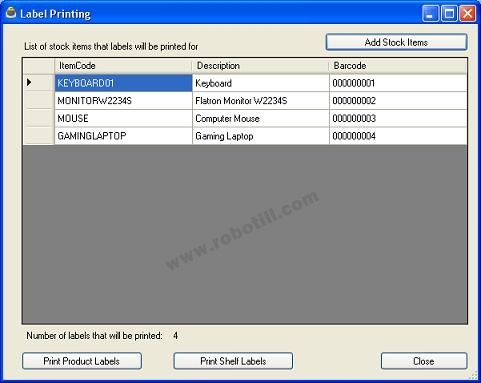 Click on ‘Add Stock Items’ and select the stock items that you want to print labels for. You can select multiple stock items. Use your mouse click and [CTRL] to select individual items or mouse click and [SHIFT] to select ranges. Click on ‘Select Stock’. A list of items that will be printed will be displayed. You can add additional items if needed. Click on ‘Print Product Labels’ or ‘Print Shelf Labels’ depending on what labels you need. To configure how your labels are printed, go to Manager > Setup > System Configuration > Retail Specific > and select the label setup you want to edit. The label setup is divided in to two sections. The label page setup (1) and the setup of the label itself (2). The page layout is where you specify where the labels on the page is located. It has nothing to do with what is being printed inside the labels. Left Margin: The left margin is the distance in mm between the left side of the page and where the label begins. Top Margin: The Top Margin is the distance from the top of the page to where the labels start. The number of rows is the number of rows of labels on a page. The number of columns is the number of columns of labels on a page. Note: If you are using labels on a roll where there is a single row (column) of labels, then there is no page. You page setup will then be for one label. Your number of rows is one and your number of columns is one. You can then also ignore the row spacing and the column spacing. 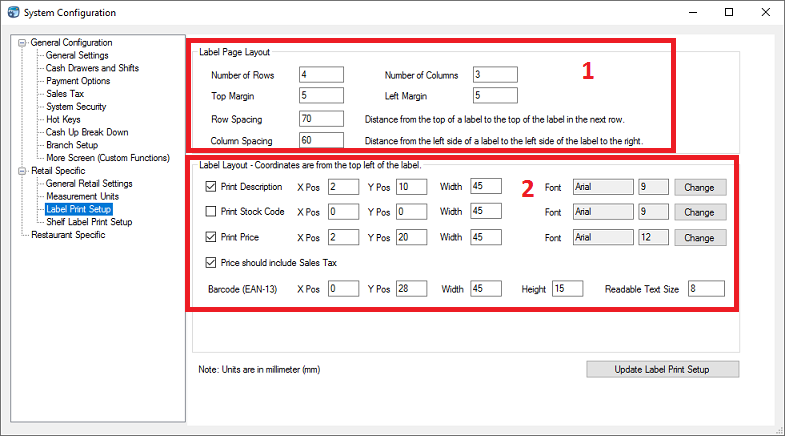 Row Spacing: The row spacing is the space in mm from the top of one label to the top of the next row of labels. 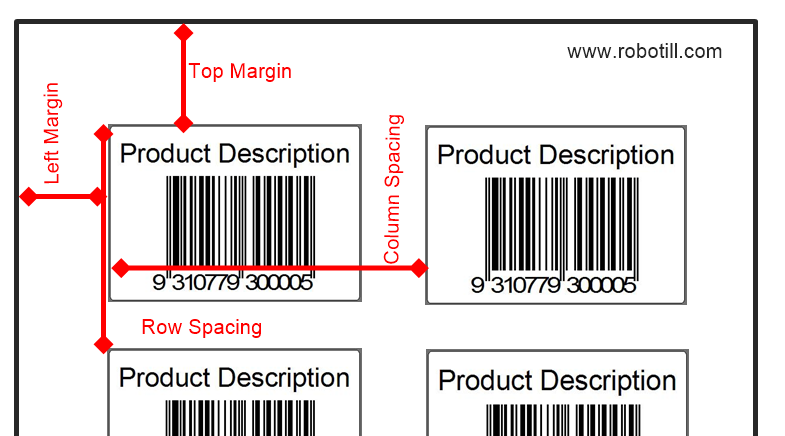 Column Spacing: The column spacing is the space in mm from the left side of one label to the left side of the next label. In the 'Label Layout' section you can check the items that you want to print on the label. All measurements in the label section are taken from the top left corner of the label and not the page. The 'X Pos' is the X coordinate. That is the distance in mm from the left side of the label to where the item should begin. The 'Y Pos' is the Y coordinate. That is the distance in mm from the top side of the label to where the item should begin. The width is the maximum width for the item. If an item is longer than the width it will be wrapped.